Interesting challenging transformation projects, which have direct and tangible business impact for clients. I started my career in Andersen Consulting on 1993. Since the beginning, I set myself the goal to become a firm Partner. I was very attracted to the Data & Analytics ambit due to its close relationship with business processes and management optimization. On the other hand, I always have had affinity with mathematics and statistics. José Manuel Cantarero, Accenture Partner who was for me a Partner’s role model. Rubén Yañez, HPE FS Sales Director who taught and inspired me in the commercial and sales work. Earl Gobin, HPE Business Intelligence Solutions LATAM Business Developer for introducing me to the business intelligence arena. Jean-Paul Breton, HPE Business Intelligence Solutions Delivery Manager, for the collaborative, structured and innovative work. José Luis Rodriguez, HPE Business Intelligence Solutions LATAM Sales Director with whom I enjoyed a constructive teaming work environment. John Medellín, IBM Partner for his analytic approaches. Ed Silva, Advanced & Analytics HPE Americas Practice Principal for his innovative business initiatives. Ignacio Toussaint, PwC Partner for his practical leadership based on trust. On the other hand Francisco Del Valle, professor in charge of my case study project for getting title of Master of Finances in Universidad Anáhuac. From him I learnt a lot of discipline and advanced analytics for corporate finances. 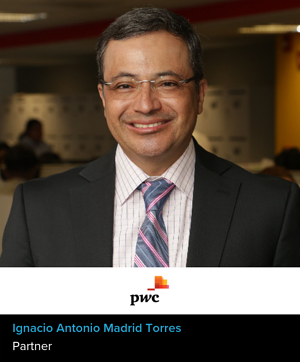 Currently in PwC I am in charge of the Digital Risk Solutions practice in Mexico. Our goal is to integrate digital solutions in clients manly focused on risk management, compliance and internal audit. We also offer the analytics on demand service in which have great business value solutions for example dealers management for automotive factories and fuel consumption optimization for fleets, among many others. To assure that the analytic solution has a business tangible positive impact in clients. To manage business expectations and be sure that business requirements are satisfied. To help my clients to succeed. Balance the technical data & analytics competencies with the core business once. To be very open and proactive in learning and adopting new technologies.